After the soft release of the game Pokemon GO in New Zealand, Australia, and USA regions, and already the game has received a massive support base eclipsing social media apps such as Facebook, Twitter and Snapchat under the number of app downloads in New Zealand along. To give you an idea of the gaming experience, playing Pokemon GO requires players to walk and explore their area at all times. The app will provide you an animated form of yourself along with a map giving silhouettes of Pokemon available near your location. For this article, I will provide tips and bits of information to help the newbie move along and a reference for the experienced players who may have overlooked a thing or two. I am, by no means, a master at this game, but I can say that I’ve learned enough things to share. i. Starters – At the start of the game, you are given the choice of taking a Charmander (Fire), Bulbasaur (Grass), or a Squirtle (Water) as your starter Pokemon. But if those three are not your thing, you have the option of walking away from the area and encountering a Pikachu (Electric) instead. iii. Alerts – Your cellphone will vibrate when a pokemon appears near you. iv. Common Pokemon – This will be annoying in the beginning of the game because a vast number of common pokemon will appear in your area like Zubat, Rattata, Doduo, among others. This is related to your trainer level. How high your trainer level is dictates the kinds of pokemon you can encounter. v. Capturing – Once a wild pokemon appears, rings around it will tell you how hard they are to catch. Green ring means they’re easy to capture, red or orange means you might need a great ball or above and add a berry to that capture. vi. Berries – What is a Berry? Raspberries are available in your items and you can throw it before your attempt, to make pokemon stay rather than escape hence making it easier to capture. Raspberries can also be acquired via Pokestops, leveling up and in-game shop. vii. Capture Tips and Tricks – To catch a Pokemon, hold the Pokeball and this will make the ring smaller before you throw the pokeball, this will give you more accuracy and greater success. You can draw a circle to your pokeball to give it some spin before you throw it, if you nail it, you’ll be getting a curveball bonus for bonus experience. viii .Avoiding Pokeball Wastage – If you miss to catch the pokemon, just pick up the pokeball quickly on the floor to gain it back. ix. Duplicates – Notice that there are 250 slots in your capture inventory. To be clear, the game covers up to Gen 1 Pokemon (151). The extra slots are for duplicate Pokemon that you capture. x. Grinding – What is the worth of capturing duplicates? There are three main reasons. The first being that each capture and pokemons evolved adds to your trainer experience level. The second being the items each pokemon have which is stardust and candy (which levels your pokemon). The third, is getting the chance to capture a pokemon with a high CP. Capturing heaps of Ratata, Pidgey and Zubat will give you a boost in XP . Before evolving, it is best to use a Lucky Egg ( earns double xp for 30min ) . xi. CP – Combat Power (CP) is the aggregate stats of the pokemon you capture or train. Given two identical pokemon with varying CP, the higher one will deal better fixed damage if not counting type weakness and resistance. CP is randomnized per capture. The higher you capture, the easier it is to train since a low CP and high CP capture uses about the same resources when being trained. xii. Training and Evolving – Unlike the usual pokemon games, training your pokemon does not involve much battling and more on an “upgrade system” using the resources of Stardust and Pokemon-specific Candy. How does one get more resources? By capturing the same pokemon and transferring the low CP ones to the Professor in exchange for the resources they are carrying. xiii. Evolving Tip – Do not evolve your pokemon right away. If the CP is greater than 250+ when you do, it will be a sweet evolution. The CP will be doubled or more once evolved. How to force your Eevee to evolve into your choice of Eeveelution! 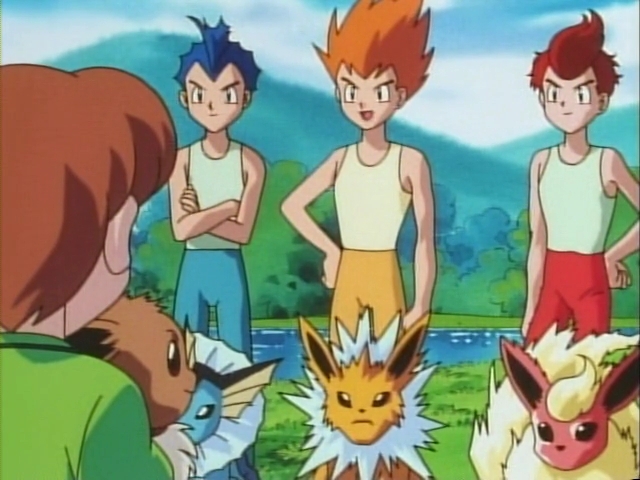 The Eevee Brothers from the original anime were named Rainer, Pyro, Sparky and they owned a Vaporeon, Flareon and Jolteon respectively. If you nickname your Eevee either Rainer, Pyro or Sparky, your Eevee will evolve into that desired Eeveelution! Before you evolve your Eevee, change the name and make sure to restart the game after. You can re-name again your Eevee after evolving into your desired Eeveelution. xiv. CP cap – You cannot train a pokemon indefinitely. There is a CP ceiling proportional to the trainer’s level that when maxed, will not progress your pokemon any further. xv. EGGS – These little things contain a mystery pokemon often acquired at pokestops or Hatching them requires an incubator and lots of travelling. Seriously, you will need to walk, run, or drive (this also works when driving at 20kph) a certain distance. Higher distance requirements mean a higher rarity of pokemon you can get. Biking to hatch poke eggs is a good idea! Get in shape while catching Pokemon. xvi. EXTRAS – You need 400 candies to make magikarp evolve into a GYARADOS. 3 candies per catch + 1 bonus for each transfer = 4 candies / total catch. i. Pokestops – Along the map, blue towers can be found in your area which are called the Pokestops, where you can find commonly used items such as pokeballs,potions,eggs, incubators,revive and level experience. ii. Item Release – Once you are in the area of Pokestops, click the blue tower and swipe the circle image to release the items. iii. Item Collection Shortcut – After you swipe the image, to save time, don’t pop the item bubbles, just exit from the pokestop as soon as it turns pink, it automatically gathers everything. This can be helpful when you are a passenger in a car and trying to catch and ride. Every 5min, the pokestops will refresh and you can access it again to get the free items. iv. Lures – Go to POKESTOPS with POKELURE. The image below will show you that a Pokelure is activated. look! A squirtle lured by the pokestop. Pokestops activated with lure will attract pokemon nearby the location and people don’t need to walk around the area. Whats good with pokelure is that it’s shareable among other players too. You don’t need to worry about how many trainers are there in the area, once a pokemon appears, everyone will get the opportunity to catch the pokemon. It will be depending on your own skill on how great you can catch a pokemon. So use all your mastery,items,prayers and luck to catch a rare one. iii. Faction Select – Selecting a team is permanent and this will be your faction so choose wisely (ask your nearby friends to be with the same team to defend your area gym nearby). iv. Gyms – You can access gyms and battle inside after level 5. You can capture a gym if there is no color assigned into it (this is common in the beginning of the game) so make haste reaching level 5 and assign a pokemon into a vacant gym. Once a pokemon is assigned, the color of the gym will change to the team that you selected. The enemy team now needs to battle the pokemon you assigned before they can capture it. Pokemon gyms also level up depending on the success of defending it. Leveling up a gym allows other players with the same team to assign a great pokemon to defend the tower. The higher the level of the gym, the more pokemons that can be assigned. Make sure to assign the highest CP of your roster to aid your chances of defending. v. Gym Battles – A gym tower will be provided with prestige(Ex. 4000/4000). You can’t takeover the gym when the prestige is full. Though you can decrease it by defeating the pokemon defending it. Even if you can’t fight until the end, killing a pokemon before the leader comes out (highest cp) will decrease the gyms prestige. You can take over the gym when the prestige runs out. Also, players with the same team color can help you tag team the defender and fight to dethrone the team who owns it. After capture, the gym will be vacated and you can assign your chosen pokemon to defend it along with other teammates. vi. Gym Defense Bonus – Successful gym defense and captures will give you stardust and gold coins to purchase on shops. Gym rewards can be collected thru the access of shops (at the upper right corner of the screen). So there you have it, the compilation of the most useful tips(for now) that I can share to you. I am still broadening my knowledge in the game and may this listing be of use to you. As a Filipino here in New Zealand to first experience the game, I want to help out not only my fellow countrymen for the ones around the world who have not played yet. Good-luck and I hope you can catch them all. ..and just a friendly reminder!